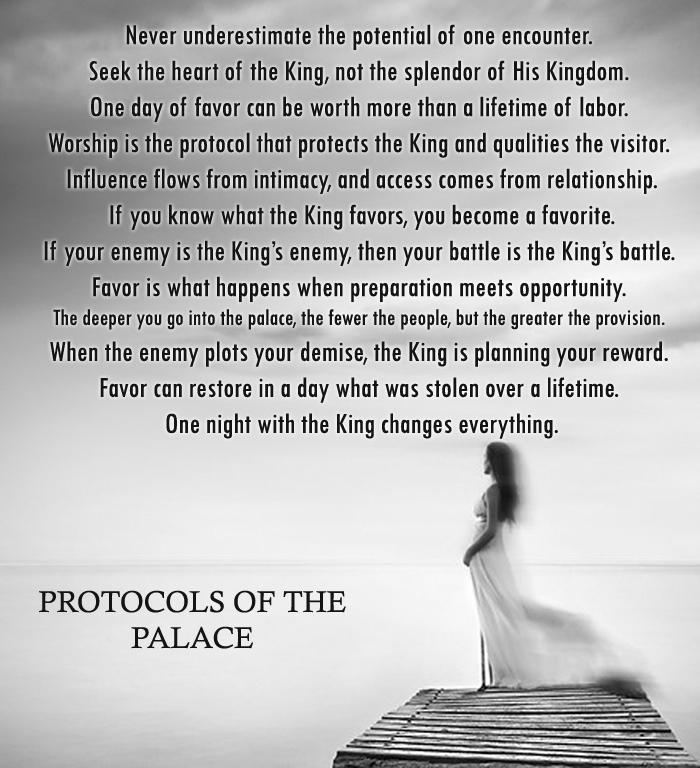 Protocol's of Palace are some of the beautiful inspirational quotes made by Tommy Tenney in one of his books Finding Favor with the King. Its all about how one can have a deeper relationship with God. We as a church are getting ready to meet our King and not everyone finds this special privilege. Many parables in bible indicate the second coming of Christ like servants who wait for masters return, five wise and five foolish woman, master who invites people for his sons wedding etc. Their are people who would impress the king and few who cannot. I really love these protocols of the Palace. I made few wall papers out of these quotes download them from the below given link. Never underestimate the potential of one encounter. Seek the heart of the King, not the splendor of His Kingdom. One day of favor can be worth more than a lifetime of labor. Worship is the protocol that protects the King and qualities the visitor. Influence flows from intimacy, and access comes from relationship. If you know what the King favors, you become a favorite. If your enemy is the King’s enemy, then your battle is the King’s battle. Favor is what happens when preparation meets opportunity. The deeper you go into the palace, the fewer the people, but the greater the provision. When the enemy plots your demise, the King is planning your reward. Favor can restore in a day what was stolen over a lifetime. One night with the King changes everything.